Two days ago Hartman called me from Felixstowe, where he was working for three days. While he was walking by the sea, eating fish and chips, visiting all the places we lived, buying Fox’s crunch creams, we remembered. We remembered how young our girls were. We remembered how cold it was, how wet, how grey, how exciting, how awful, how lonely. This led to many memories old and dear. It took me far back to our homeland, before we packed up, to days of golden sun, warm cuddling friendships, lazy beach days, back breaking work sessions, hat wearing sports events… all of which happened barefoot. We learnt in England to wear shoes, after the girls have been frowned upon for running at school events barefoot, for running barefoot through the lobby of the hotel to quickly pick up Dad from work(truth be told, it was February…), I have learnt to keep shoes close by for when the doorbell rang and I learnt not to kick out my shoes when arriving at a friends house. It has been a long time since I’ve had to remove some thorns from my feet. It’s been a long time since I’ve felt mud squishing up between my toes, or heated up my feet in a warm puddle of cow dung,….disgusting maybe, but those who grew up on a farm, will know what I’m talking about. They’re quite beautiful now, my feet, very soft and supple, lovely pedicured and all, which is something to be grateful for I suppose. But when the chance for being barefoot shows up at our door, we still happily kick off those shoes and dash across the lobby. nice 😀 i wish i could draw my feet with as much ease. i do know about running around barefoot though 😀 pretty common growing up in India. Took to wearing slippers when i discovered that not doing so was one of the triggers for an allergy attack . Gorgeous & sensual. Love to look at these. Ronell — OH WHAT WONDERFUL FEET!!!! And memories and thoughts! I used to run around NY sidewalks and mud with barefeet .. grew many a callouses .. and sure do miss those days …! I LOVE your paintings and your use of shadows. 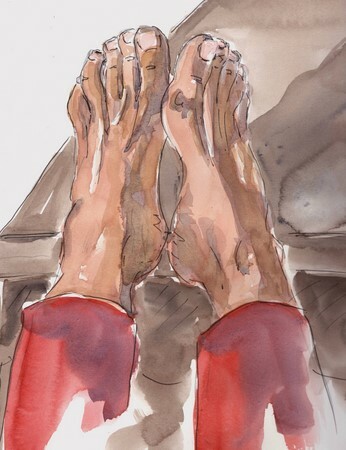 Wonderful tale, gorgeaus feet sketches (not to forget the gorgeous feet:)). My absolute fav. has to be the first one, I just love its vibrant colours and the dramatic treatment of the shadows. I can’t wait to get back to China where I can have my weekly reflexology sessions for the fracture of the European price… I love to have my feet pampered. I can imagine cow dung can be very pleasant too, but never tried it. Well, not yet. I don’t think I can remember running through cow dung – but I still wince at the memory of chicken poo. Vivid, entertaining writing, as ever, Ronell and sweet feet! To celebrate your blog entry I’m going to go paddling down at the beach and feel sand between my toes. What a treat. I loved reading this post, Ronell. It brought back memories of our trip to England to visit with family back when I was fourteen. Granny was shocked that my siblings and I were barefoot a lot of the time. Once, when my sister and I walked down the street to the corner shop barefoot, people would actually stop and stare at us like we were freaks. LOL Being barefoot was so much the norm back then in Australia. Nowadays, we tend to go barefoot only in our homes, yards and, of course, at the beach. 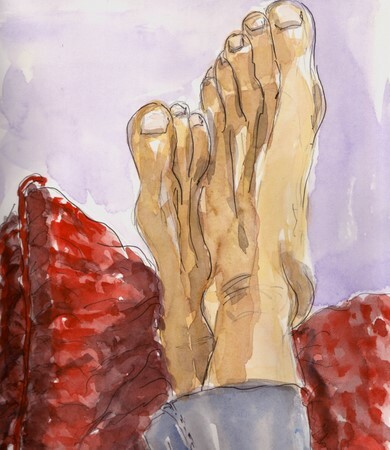 Sorry for digressing….LOVED your sketches….great feet!! paintings and story that is! Beautiful post and fabulous sketches Ronell. Living in the Fens, in England, I can happily report that my children are rarely seen wearing shoes of any kind. My youngest walks upon the shingle, thistles, stinging nettles…barefoot. My eldest feeds the animals and dashes over to my parents opposite the yard…Barefoot. Me…Well let’s just say my feet are anything but beautiful. Tough, mostly naked and always looking a little grubby which is fine until I need to wear evening shoes! It’s good to feel the earth you walk upon, freeing! I also have it on good authority that it is very good for you to walk upon the early morning dew barefooted, especially women. I often do this and, damp footed, I breath in the virgin fenland air at the start of a new day…It’s a very calming way to start the day and allows me time & peace to appreciate all I have. lovely paintings and wonderful memories. I am fortunate enough to live in a climate where I run around barefoot ALWAYS at home. We do kick off our shoes when we come indoors or visit! And it’s sandle time so time for toe rings and ankle bracelets! These are wonderful Ronell. I grew up barefoot too, in San Diego, California. I never wore shoes (except to school or jobs) and my feet were so tough I could walk on the hot beach sand or the hot sidewalk with no problem. When I took my drivers license test the examiner tried to tell me I had to wear shoes but I told him there was no law that said so and he gave in. It wasn’t until I moved to New York City when I was 19 that I stopped going barefoot. My first walk down the street I stepped in glass, spit, etc. and that was the end of that. I still go barefoot at home and around the yard though. I actually liked the way it sounds to warm ones feet in a squishy cow pie. I bet it felt better than mud! Thank you for the comments- I loved all your stories about your barefoot days…wonderful to hear that it is a freedom still loved by many. It is so true what Anita says…to feel the raw earth beneath your feet, is to feel something freeing your soul. What a wonderful story Ronell. I have never liked being barefoot in my entire life, till that is, I got to that magical age all we women must endure. I now find the floors so soothing and (cooling). As for the great outdoors and bare feet I’ve never done that, but you make it sound so relaxing and fun. As summer is fighting to stay here in Canada, I just might give it a try. Love the sketches. (being barefoot dosn’t seem to have done them any harm). Ronell, I loved this sweet and sentimental post. The paintings and your nostalgia are a lovely combination. Japan might be a great home for your feet!! great story about your feet…and going barefooted…too bad you were not in the south…you could have gone barefooted here! These are really great. All of them. I love your approach Roneel. It makes me quite envious! Wonderful post. (I love reading your story’s)Wonderful memories for you.Wonderful sketches.Happy Mother’s Day to you. That reminds me of this – done years ago! This time I hope it gets posted … enjoyed your post and the paintings are lovely – particularly the middle one. Reading about being barefoot made my toes curl in delight – I love the feel of dew-wet grass.And strangely enough, I live in Ipswich – and am regularly in Felixstow as it’s my nearest coastal town and I miss living by the sea. Small world! As a three-year-old, I was evidently known as “the little girl with green feet” because going barefoot was seen as such an oddity! My father was originally South African, though … perhaps that’s the connection …Suffolk!! It’s so close to where I am now.Love your sketches, and your words. Wonderful story and paintings. I can only agree with all that has been said before. ahhh ! barefoot. I’ve enjoyed going barefoot since I was a child too… now I find it so freeing especially when I play music-I’m a violinist- it always goes better when I’m barefoot! I always enjoy your free and happy sketches. They are beautiful feet! Not just the way you painted them, but simply them, their shape! What a great post, Ronell! I also went barefoot all the time when I was a kid, even in New Jersey – and sometimes I forget and answer the door here in France with bare feet. The looks I get are terrifying! I get such a sense of freedom from your description of enjoying your barefootedness! And the paintings seem to communicate that revelling in such simple freedom. Lovely post! By the way, I’ve tagged you – but just realised reading through your comments that I’m not the first. Sorry! 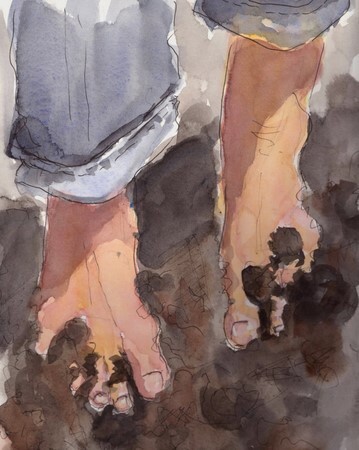 Beautiful – I used to stub my toes so often as a child as I went barefoot all summer. Great feet Ronell. And I’ve tagged you too! Seems someone else got here before me, but it’s too late to change. I’ve got you up on my blog. So come on over and check the details! Hi there, You have been tagged. To check it out have a look at my blog!I like the first feet pic. What fun, both story and sketches, Both show so much of who you are and it is simply GREAT. For someone melancholy you ROCK! What fun!!! I especially love the one with mud between the toes, that’s about as free as you can get!! Ronell, it seems your foot post was a hit! I enjoyed it too! I always liked being barefoot as a child and found that I haven’t yet outgrown it. Shoes suffocate my feet. My kids are taking after me and take off their shoes as soon as they get home. In warm weather we often wear flip flops when we need to go out because they are the most minimal shoes allowed. Oh my! I grew up barefoot. The bottoms of my feet were as hard as leather from going everywhere barefoot. My husband hated that (he’s from New Jersey) and wouldn’t let our kids go barefoot. I told him, sorry, you married a hillbilly! lol! Anyway, he hates it when I get back from girl weekend, especially if we’ve been in the mountains because the first thing I do is ditch the shoes. Thanks for bringing back some memories.